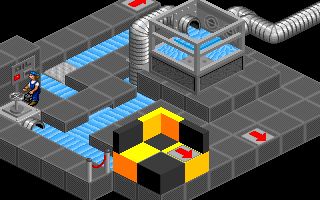 Contraption Zack is an isometric puzzle game published by Mindscape in 1992. I can’t say it’s a game I know much about but I saw it for sale fairly cheap and remembered playing a demo version many years back which was enough to reason to pick it up and several months later I thought it was time to play it. The version I have was published by Slash who typically repackaged games more cheaply after they were slightly past their prime. I gather they are often avoided by collectors for this reason. The box exterior is nice enough at any rate although the materials are a little cheap. 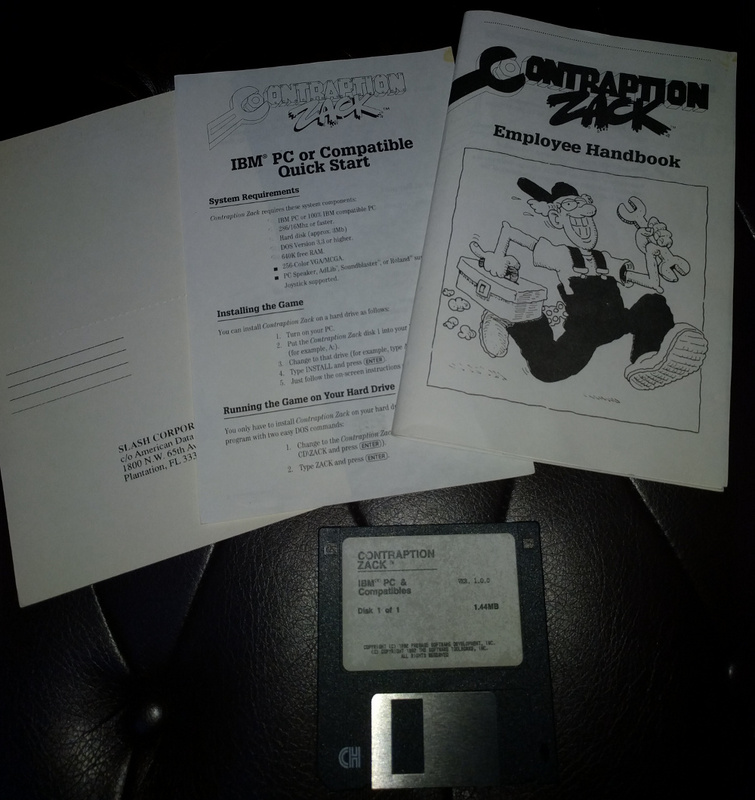 The contents are where the real money has been saved with the manual looking like a cheap handmade photocopy. 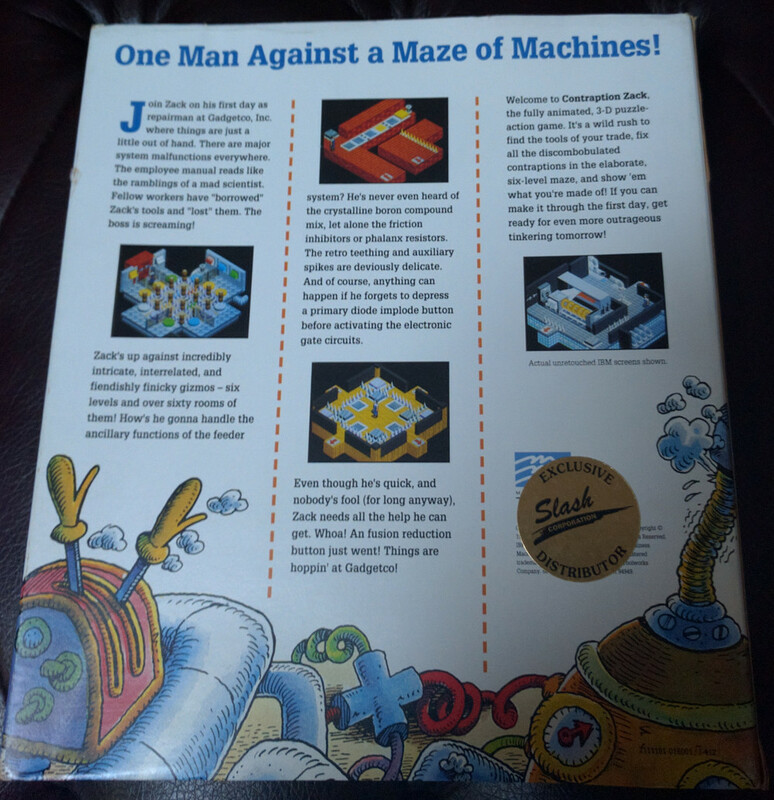 The entire game fits onto a single floppy with an equally cheap label. 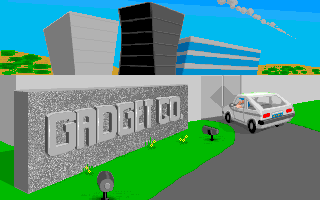 As for the game itself, there is a nice cartoon intro on starting up. 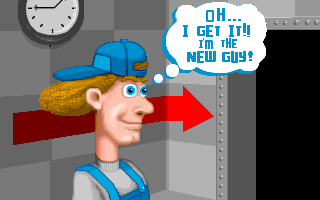 It’s Zack’s first day on the job working as an engineer in a plant of some description for Gadget Corp. His new colleagues take an instant dislike to him and decide to “borrow” all his tools only to not return them when duty calls. The graphic style is goofy but colourful. 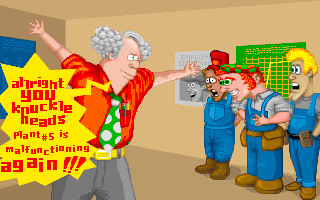 I particularly liked the panicked boss with the waving arms for some reason. Probably because he reminded me of a particular ex boss of my own. 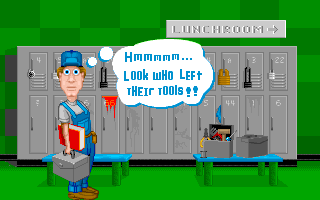 At any rate, he sends Zack off to fix a piece of machinery in the plant.That’s where the player comes in. 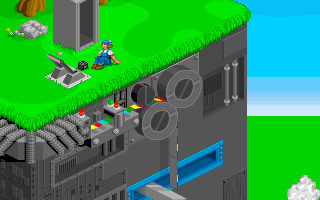 You have to guide Zack around 6 levels retrieving his tools and fixing the parts of the factory at the end of each level. 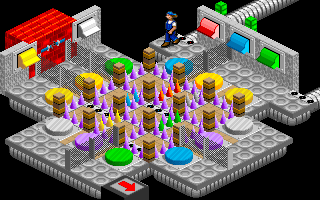 The mechanics of gameplay are straightforward and introduced gradually starting with this room where each coloured switch will open or close the same colour of spikes. The trick is simply to head right instead of left here. 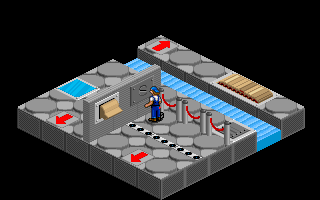 If you go the wrong way, you will get stuck and have to start the level again. 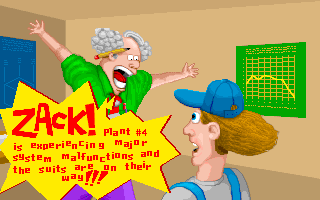 The designers had no qualms about dead ends so expect to do plenty of restarts when playing this. 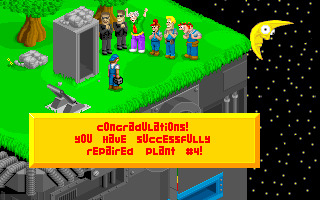 They do show an element of sympathy with a couple of save points per level. The next room is a more complex timing puzzle. The grey gates open slowly one at a time trapping Zack behind them for a time if he goes in. All the coloured buttons only stay down for a short while when pressed meaning the key is not to step on the back buttons until the gate is about to reopen so there is time to get over the spikes before they spring back up again. Once more, it is easy to get trapped between spikes and have to restart. Soon after this I get the chance to reclaim all my lost tools. 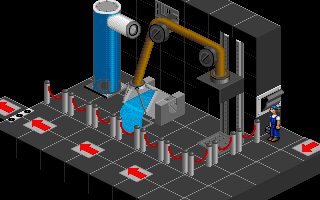 Each tool can be used at specific points throughout the level to affect gates or machines. 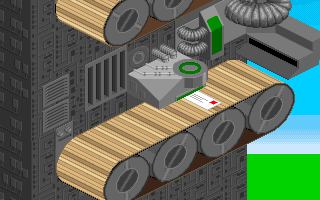 In this case, I need a screwdriver to turn the screw on the screen in the top right and reverse the direction of the conveyor belt and allow me to pass. That clears my route through to the feeder. I step on the floor switch to get it working and that’s the first level.done. 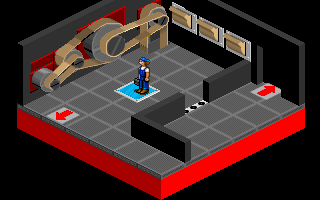 I’ve missed a good few rooms out here but the 6 levels in this game really aren’t very big. They do involve a lot of back and forth to make up for it. 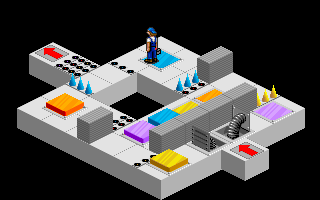 Level 2 is much the same except with a couple of rooms more, lots more dead ends and a whole heap of extra switches to complicate matters. 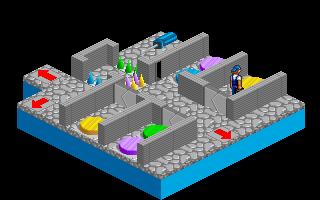 And each level after that progresses in much the same way. The difficulty ramps up but the gameplay elements are all introduced early on. 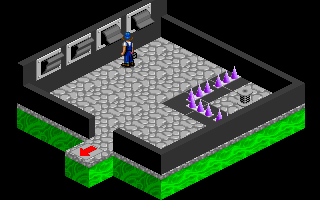 I’ll give particular mention to the room above on level 5 which was especially evil. 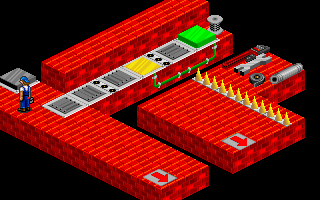 The basic goal is to get to the wire on the red wall and back out to the bottom left. Each button at the edge of the grid will lower most of the spikes on that row one at a time with just enough of a gap to walk across before they raise again. It will also start the same sequence off on another row so it is possible to swap between the two if you are quick. Miss the gap and you are stuck and have to restart the room. 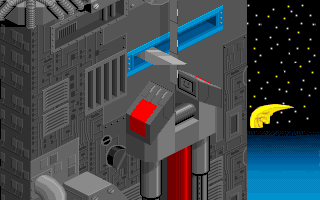 Completing the room involves going through everything in the right order, setting two buttons off at once at a couple of points, along with having all the coloured switches in the right position at the right times. 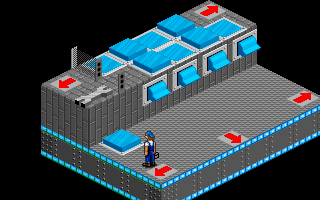 It took numerous efforts to complete but the save point at the start of the room stops it becoming too frustrating. 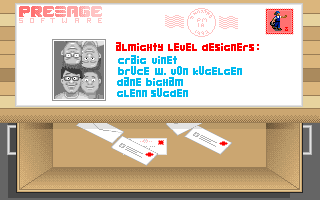 Level 6 proves to be a bit simpler than the previous one if anything. There are plenty of switches but once I realise that most of them do the same thing, I’ve soon fixed the last machine and the plant springs into life. After all these efforts, the plant erupts out of the ground creating a giant metallic skyscraper. Despite the size of this thing all it does is print and stamp letters. 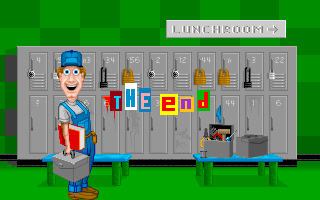 Those letters turn out to be the end credits before a final epilogue in which Zack gets his revenge. 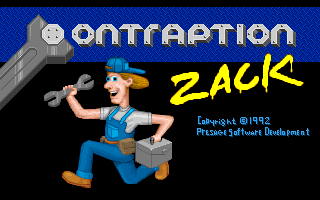 Contraption Zack proved to be a short, simple game that I finished in one sitting. It certainly wasn’t anything brilliant but I enjoyed it enough. 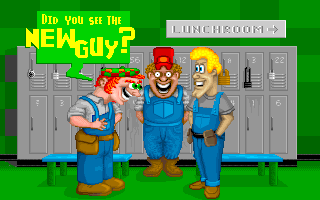 The bright graphics offer plenty of character and the puzzle gameplay hasn’t dated at all. What has dated is the amount of replaying required which you wouldn’t normally see in a game these days. I wouldn’t say it was a game breaker though given the size of the levels. 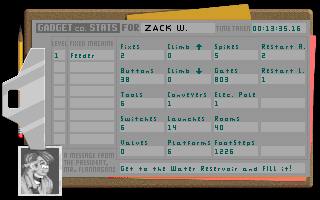 Provided you like logic puzzles, Contraption Zack offers a pleasant if unspectacular way to spend an afternoon. 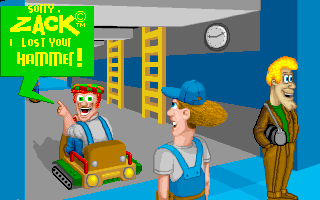 The MT32 soundtrack wasn’t the best so I’d be tempted to try the Amiga version if I was to play it again in hopes that it was an improvement. 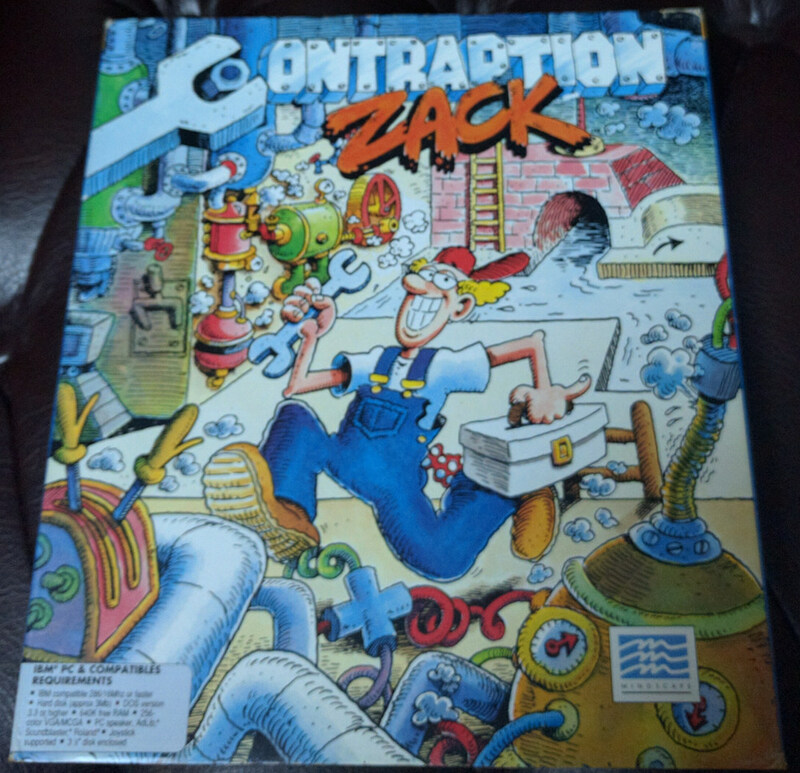 This entry was posted in Off Topic and tagged contraption zack, contraptions, mindscape, puzzle by Pix. Bookmark the permalink.